Hashimoto’s Thyroiditis, named for Japanese physician Hashimoto Hakaru who first described the symptoms of the disease, is an autoimmune disease in which the body thinks the thyroid is a foreign invader (like germs). Your body creates antibodies against your thyroid which then attack it. Yes, your body ATTACKS your thyroid. (Can’t we all just get along?) As a result, your thyroid struggles to produce enough hormone to regulate your body, but can’t. This disease mainly afflicts women and is hereditary. If you know someone in your family that has Hashimoto’s Thyroiditis or Hypothyroidism, get tested for it. Sufferers of Hashimoto’s Thyroiditis complain of a number of symptoms such as weight gain, sensitivity to heat or cold, inability to concentrate, depression, and more. Visit my Symptoms page for a more detailed list. There are many symptoms of Hashimoto’s Thyroiditis and they are often very vague. Many doctors mistake these symptoms for many other diseases and conditions. It is important that if you suspect Hashimoto’s Thyroiditis or other thyroid problems that you get tested by your doctor to confirm or rule out thyroid issues. Hashimoto’s tends to be a heriditary disease, so if someone else in your family has it, you are at risk. Thyroid diseases also put you at risk for a number of other diseases and conditions, such as diabetes and Rheumatoid Arthritis. You can read about these and other conditions thyroid patients are susceptible to on our health risks page. There is a similar autoimmune disease which is somewhat the opposite of Hashimoto’s Thyroiditis because the thyroid produces too much hormone. It’s called Grave’s Disease, which you can read about here. Grave’s disease may be the opposite of Hashimoto’s Thyroiditis, but that doesn’t mean a Hashimoto’s patient can’t go hyperthyroid. In fact, they often do if their condition is overtreated with medication. What is the difference between Hashimoto’s Thyroiditis and Hypothyroidism? Hashimoto’s Thyroiditis is an autoimmune disease. Sufferers of this disease will have to continue treatment with thyroid hormone medications their entire lives. The result of the disease is hypothyroidism. Hypothyroidism is a condition in which the thyroid is not producing enough thyroid stimulating hormone. Hypothyroidism can result from different things like iodine deficiency, viral infections, certain medications, and sometimes pregnancy. Hypothyroidism may be temporary or permanent, depending on the cause. 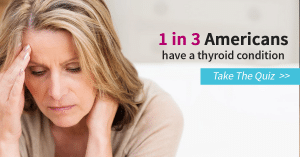 In short, you will almost guaranteed become Hypothyroid if you have Hashimoto’s Thyroiditis, but you don’t have to have Hashimoto’s Thyroiditis to become Hypothyroid. You’ve got the Hashimoto’s Thyroiditis basics now. Check out the Symptoms page!